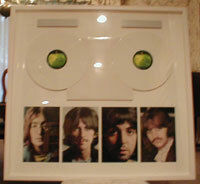 Albums Vinyl Beatles Special White Album Laser White Discs Issue Professionally Matted and Framed. The Purest White Ever with Photos. 35 1/2" x 34" German $ 945.00 Click Here to see a photo of the item.